A key theme of many Beatles films is a focus on their early formative years plying their trade as a working band in Hamburg, Germany. Backbeat is perhaps the most fondly remembered and it is centered on the band’s original bass player and ‘Fifth Beatle’ Stuart Sutcliffe. Sutcliffe’s tempestuous relationship with John Lennon gives the film a compelling edge while the performance scenes featuring the band playing the early rock n roll songs that defined their first years are supremely thrilling. Check out the soundtrack album as well to hear songs like ‘Rock & Roll Music’ and ‘Twist & Shout’ performed by an all star supergroup of early 90s rock stars including Dave Ghrol of Nirvana, Thurston Moore of Sonic Youth, Greg Dulli of The Afghan Whigs, Dave Pirner of Soul Asylum, Don Fleming of Gumball and Mike Mills of REM. 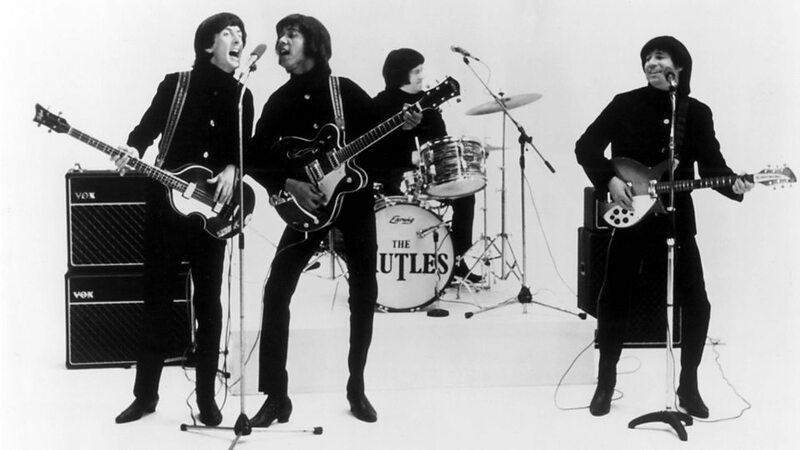 As great as the Beatles were they were always ripe for parody and nobody does it better than The Rutles. Mirroring the Fab Four’s rise to fame, Eric Idle and Neil Innes’ film playfully pokes fun at the band while paying homage to their genius at the same time. With a plethora of cameos by the great and the good of British comedy, as well as rock icons like Mick Jagger, Paul Simon and a certain George Harrison popping up. it is the gold standard of pop mockumentaries. Now here’s a Beatles film that’s genuinely really good. Not just in a good for a music film kind of way either, it even has Oscar nominations and everything. John Lennon is the most complex and fascinating of all the Beatles and more often than not he is the focal point of Beatles films. This one goes back to his childhood with particular focus on his relationship with his mother Julia and how his teenage band The Quarrymen evolved into the Beatles. The film is low key and moving, painting a quaint and whimsical picture of an evolving country moving on after the Second World War with inspired young kids like Lennon coming of age and making their way into the world. The opposite to a film like Nowhere Boy, Across The Universe is lavish and excessive. A musical in the spirit of broadway it contains all their hits and is visually impressive but lacks substance. As an exercise in ambitious excess though it fits in with the Beatles late period grandiosity. When you think of The Bee Gees it’s almost been airbrushed out their history that the first major project the did at the height of their imperial phase post Saturday Night Fever was this monstrosity. By far the strangest take on the Beatles on film, this overblown rock opera was helmed by the Gibb brothers’ manager Robert Stigwood and they star alongside Peter Frampton in one great big musical car crash that tanked at the box office. Not the most humorous guys in the world the Bee Gees are as wooden as you can get but the film has since gone on to become something of a cult classic befitting its status as one of the greatest failures in rock history.